Isis was the sister-wife of the legendary Egyptian god-king Osiris. Osiris was killed by his evil, jealous brother Seth, who cut his body in 39 parts. He buried each part in one of the 38 (later 42) provinces of the country. The "jewels of the family", as the French call them, were eaten by a fish. Isis wandered through the whole kingdom, collected the parts and brought them to Anubis, the shakal god. (Normally the shakal devours corpses. But probably Anubis should be diverted from doing so by promoting him to God of Mummification.) Anubis reunited Osiris' body by wrapping it into a cotton cloth. This is the origin of wrapping mummies as sign of resurrection. 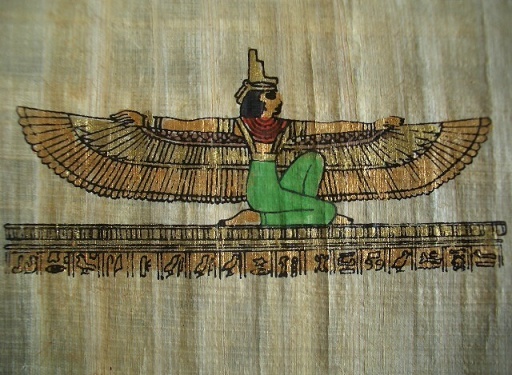 Being a goddess, Isis had wings. She spread these and fanned the breath of life into Osiris. He woke to life, created his future son Horus with Isis and died after a few seconds. He was brought back to life as judge of the dead, one of the most important gods. When Horus became a man, he revenged his father and killed Seth. Seth became the god of the underworld, model for the devil in later religions. The fanning of air with wings became a general protective gesture of other gods and various incarnations, too. Every pharaoh was an incarnation of Horus. An important religious cult developed around the ideal, venerated pharaonic couple Isis and Osiris. It was practised until the middle of the 6th century A.D. on the island of Philae, and reliefs of the famous legend can yet be seen in the tempels. Those have of course meanwhile been „transplanted“ to the island of Agilika. Their original places are now covered by the waters of Lake Nasser, same as Abu Simbel. The Greek historian Herodotus wrote, that according to ancient egyptian legend, the Nile originated from the tears of Isis, mourning the loss of her beloved Osiris. Therefore searching for the source of the Nile was forbidden at the risk of the wrath of the gods. To the original names Isi and Osiri the Greeks added an s as in other ancient Egyptian proper nouns. Modern archeology has found a granite sarcophagus attributed to Osiris in a 98-foot-deep tomb at the Giza pyramids dated to 500 B.C. It was surrounded by the remains of four pillars built in the shape of a hieroglyphic "Bir" or "House of Osiris." The excavation unearthed 3,000-year-old bones and pottery. 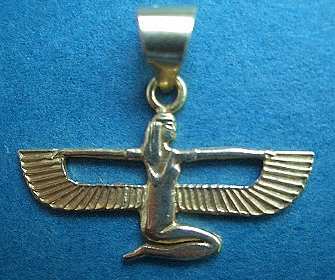 Modern Egyptian jewellers create pendants representing Isis after the model of ancient temple reliefs in the customary 18 carat gold or in silver. They belong to the more tasteful, if somewhat expensive souvenirs from the Nile. The gold hallmark shows by the way the 18 in so-called "Arabic“ figures ( ١٨ ). They originated in reality in India. Proof is that they are also in Arabic – which is normally written from right to left – written from left to right. They are only called Arabic, because Arab traders brought them to the West. And talking about silver: The precious metal is a gift of Isis as moon goddess.